This test demonstrate the presence of catalase, an enzyme that catalyses the release of oxygen from hydrogen peroxide (H2O2). It is used to differentiate those bacteria that produces an enzyme catalase, such as staphylococci, from non-catalase producing bacteria such as streptococci. Normally 3% H2O2 is used for the routine culture while 15% H2O2 is used for detection of catalase in anaerobes. The enzyme catalase mediates the breakdown of hydrogen peroxide into oxygen and water. The presence of the enzyme in a bacterial isolate is evident when a small inoculum is introduced into hydrogen peroxide, and the rapid elaboration of oxygen bubbles occurs. The lack of catalase is evident by a lack of or weak bubble production. The culture should not be more than 24 hours old. Bacteria thereby protect themselves from the lethal effect of Hydrogen peroxide which is accumulated as an end product of aerobic carbohydrate metabolism. The morphologically similar Enterococcusor Streptococcus (catalase negative) and Staphylococcus (catalase positive) can be differentiated using the catalase test. Also valuable in differentiating aerobic and obligate anaerobic bacteria. Semiquantitative catalase test is used for the identification of Mycobacterium tuberculosis. It is used to differentiate aerotolerant strains of Clostridium, which are catalase negative, from Bacillus species, which are positive. Catalase test can be used as an aid to the identification of Enterobacteriaceae. Pour 1-2 ml of hydrogen peroxide solution into a test tube. Using a sterile wooden stick or a glass rod, take several colonies of the 18 to 24 hours test organism and immerse in the hydrogen peroxide solution. Use a loop or sterile wooden stick to transfer a small amount of colony growth in the surface of a clean, dry glass slide. Place a drop of 3% H2O2 in the glass slide. Observe for the evolution of oxygen bubbles. Examples: Staphylococci, Micrococci, Listeria, Corynebacterium diphtheriae, Burkholderia cepacia, Nocardia, the family Enterobacteriaceae (Citrobacter, E. coli, Enterobacter, Klebsiella, Shigella, Yersinia, Proteus, Salmonella, Serratia), Pseudomonas, Mycobacterium tuberculosis, Aspergillus, Cryptococcus, and Rhodococcus equi. Negative: No or very few bubbles produced. The test organisms should not be taken from blood agar culture. Red Blood cells contain catalase and their presence will give a false positive test. Culture should be 18 to 24 hours old. Hydrogen peroxide must be fresh as it is very unstable. Iron wire loop should not be used. Some bacteria produce a peroxidase that catalyzes a breakdown of hydrogen peroxide causing the reaction to be weakly positive; (a few bubbles elaborated slowly). This should not be confused with a truly positive reaction. 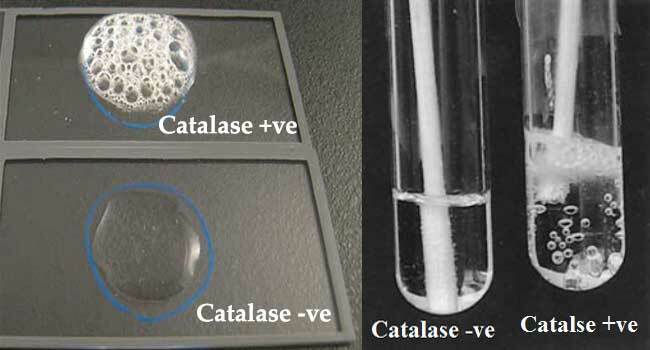 how does the use of iron-containing loop cause false positive result in catalase test? Hello Mr Sam, I’m glad I stumbled upon this wonderful information. My name is Zaynab, I’m a student in Medical Laboratory Science at The University of Lagos, Nigeria. I would love to join your whatsapp group, hopefully, there’s still space. i wana ask you pple a question. is it possible that a positive catalase bacteria can be cocci/streptococcus and similarly catalase negative can be staphylococcus….? im working on some unknown halophilic bacteria. im confused that microscopically these bacteria are cocci and gives catalase positive results…. how do you determine or measure the 3% or 15% of hydrogen peroxide during catalase test. and what is the best selective media for isolation of Streptococcus iniae? I am finding very difficult to differentiate Rhodococcus sp, from Roseomonas and Methylo bacterium. Can you help? If you are trying to distinguish between Enterococci and Lactobacillus, should you use 3% or 15% (as they are both facultative anaerobes)?